Feeling fabulously mellow and relaxed today. I’m mellow because I feel that even though there is a busy week ahead, i’m ready for anything. What’s contributing to this inner sense of calm is the fact that I got 2 awesome meals planned and they are going to be a breeze to prepare…even after work. I’m pretty much gonna relax, put my feet up…oh who am I kidding? I’m gonna sit down and blog about it. I don’t know bout you folks but man, after i’ve had a long day at work, when the lion refuses to leave day care (even though he refused to go in at morning drop off??) 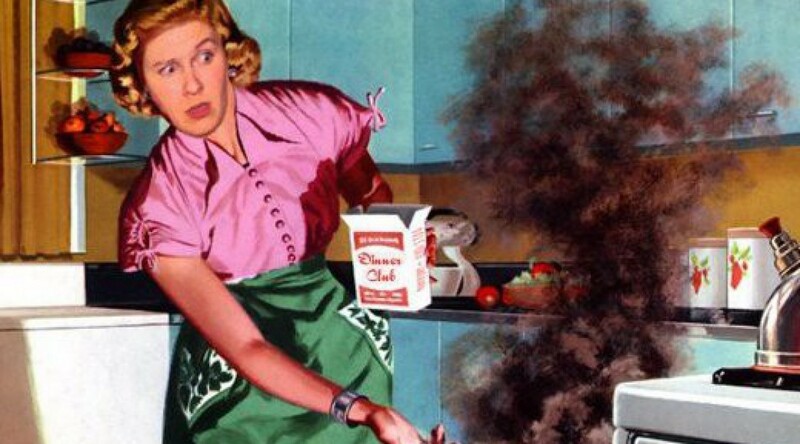 and I have to bribe, persuade or throw that 43 pounder over my shoulder, i’m exhausted…the last thing I feel like doing is cooking and I actually love to cook. There are times when I ponder giving the lion a PB and J sandwich AGAIN because I know he won’t complain and it will be easier. But today, i’m feeling good, I feel like I got it going on and that this one little piece of prep is going to set me up for dinner success for at least 2 days! Can I get a woot woot??? 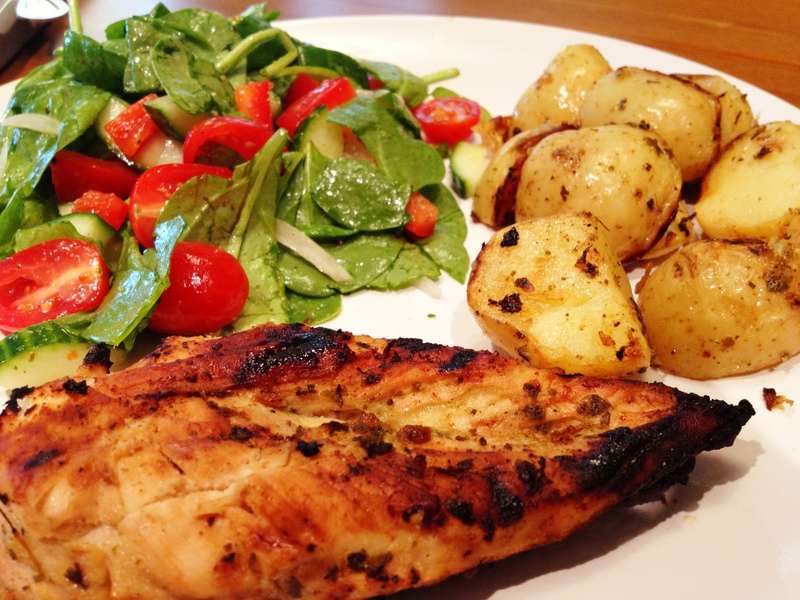 Seriously, 5 minutes of your time will provide you with serious flavour for several meals. Let’s do this shall we?? 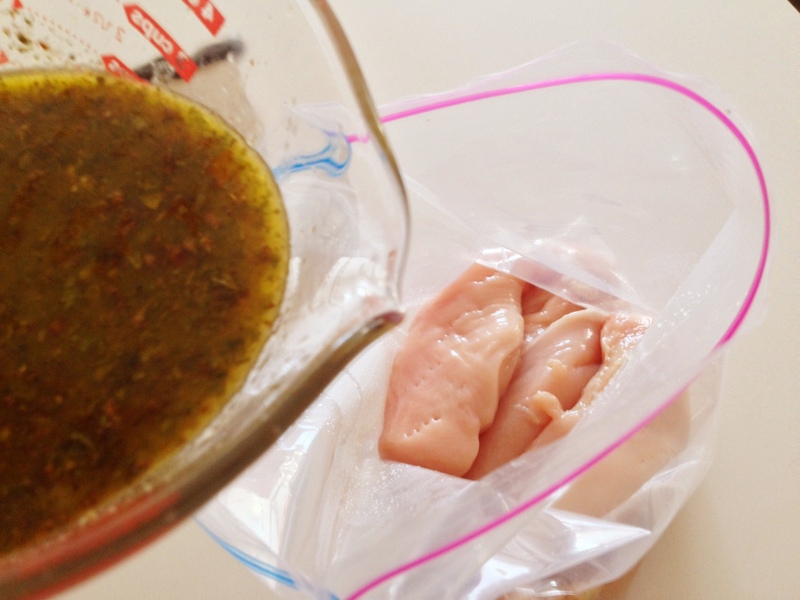 Today i’m going to make Souvlaki style chicken but i’m going to do it in a pretty big batch. Enough for 2 adults and a 43lb toddler who has a pretty big appetite to enjoy over 2 dinners (with sides) and enough for me to pack for one lunch. Next make your marindade. I pretty much throw everything (Olive Oil, Lemon Juice, Oregano, Minced Garlic, Onion Powder, tiny bit of honey and a few chopped sundried tomatoes) in to one of those big pyrex measuring cups and whisk with a fork and you are laughing. 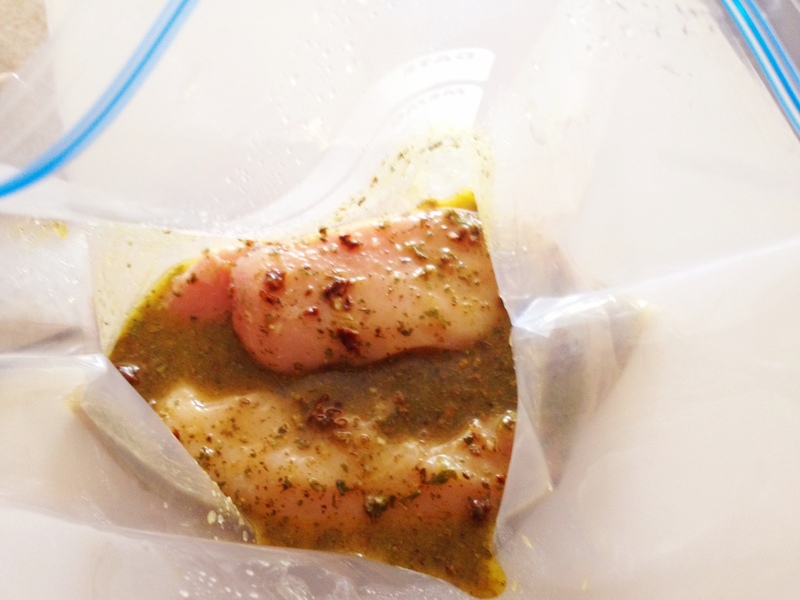 This marinade is super simple and gives a really great flavour to the chicken (you could use this for pork or beef as well so it’s pretty versatile). Okay so here is a little tip for you on how to maximize your budget. Sometimes people see ingredients and think, i’m not buying that, it’s way too expensive. Sun dried tomatoes sometimes fall in to that category. The ones you see packed in oil in jars are WAY more expensive that actually buying them dried. Seriously I got a bag of sun-dried tomatoes for $2.50. If I want to re-hydrate them, I just place them in hot water. If I want them in oil, I can do it myself. Buying them dry is a really great way to maximize your budget and use them in a variety of ways. Next you are going to take the air out and seal the bag. Now you get to massage the chicken, get all of that yumminess right in there. Pretend you are Monica from friends giving the worst massage of all time…kinda pointy! 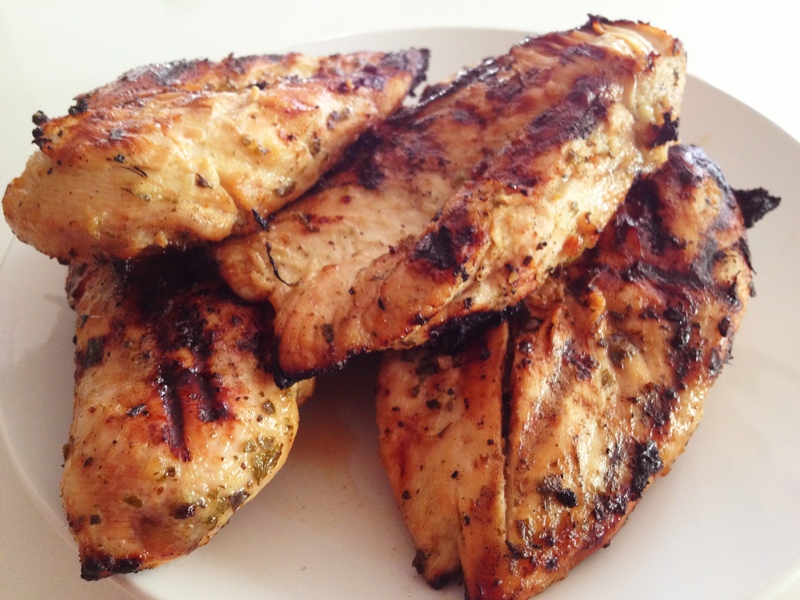 Set aside in your fridge until you are ready to grill. 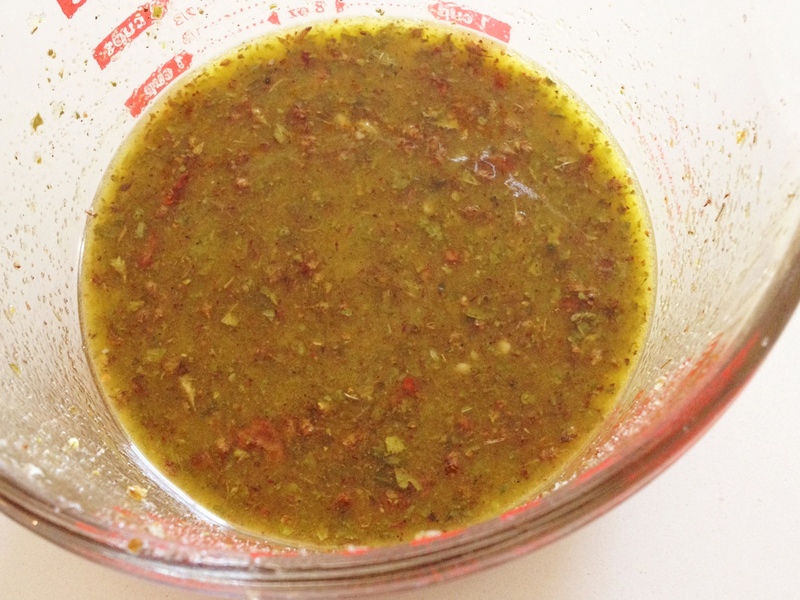 Here’s the deal, I made this marinade up on a Sunday and grilled it on Tuesday for Tuesday and Wednesday meals. Having it marinade for a few days in your fridge really adds to the flavour but if you just can’t wait, a few hours should do the trick. Here is what the finished product looks like fresh off the grill. I paired this with a simple salad and my Lemon Grilled Potatoes (recipe coming soon) and it was a pretty awesome meal for a work night!! Next post, I will show you how to maximize the heck out of your left overs and turn that souvlaki chicken in to an even easier weeknight meal that hits the spot and takes 5 minutes to prepare. Now mellow out, cuz you pretty much rocked it this week where dinner is concerned. 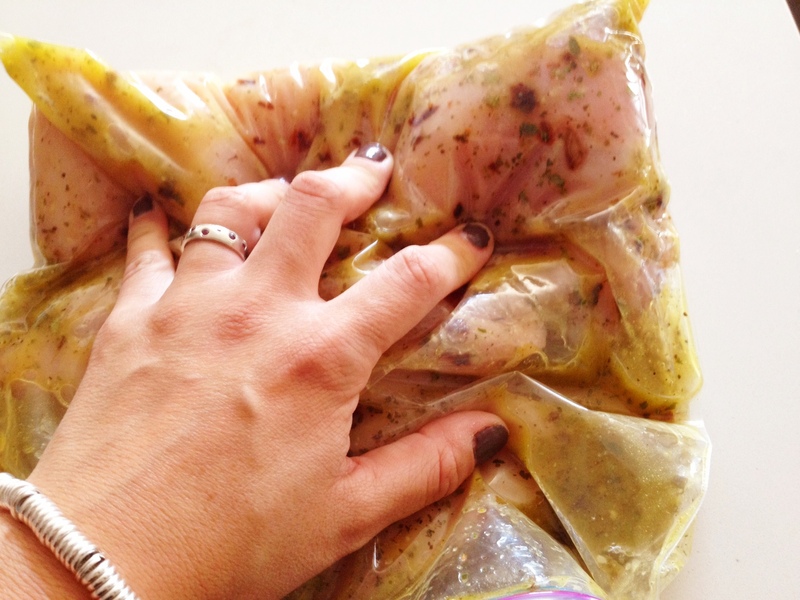 Seal the bag and massage the marinade in to the meat.